The zombie apocalypse, a haunted house, the bowels of Hell, a Trump presidency – all very frightening scenarios that make, or could make, for some scary horror films. While hopefully no one will ever have to experience any of those things, in the real world, there is nothing more terrifying than the horrors of war, and they’ve made for some classic movies. From Apocalypse Now and Platoon to Saving Private Ryan and Black Hawk Down, these movies have depicted the brutality of war in graphic detail. 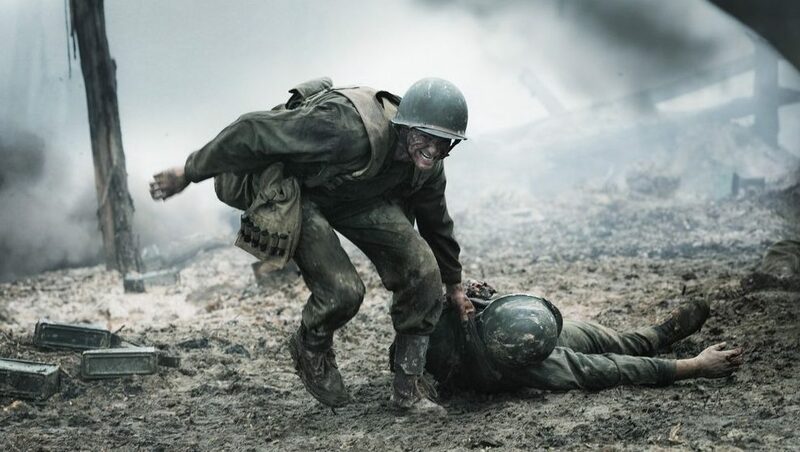 Now, take a pacifist who refuses to even carry a weapon, and place him right in the middle of one of the bloodiest battles of World War II, and you have the setting for Mel Gibson’s triumphant return to the director’s chair, the stirring Hacksaw Ridge. From the opening frames, we are thrust right into the midst of battle, and as we witness explosions, men ripped apart and flaming bodies flying through the air, any thoughts that this might be a more peaceful account of war are immediately thrown out the window. We are then transported to rural post-WWI Virginia where we meet a young Desmond Doss, his brother, Hal, and their religious parents. The dad (Hugo Weaving of the Matrix and Lord of the Rings films) is a veteran suffering from PTSD who takes out his anger on his kids and wife (Rachel Griffiths). After a traumatic incident between the two brothers, Desmond embraces the biblical commandment, which states, “Thou shalt not kill”, completely to heart, and that’s carried into adulthood. Now, a young man (Andrew Garfield of Spider-Man), after a love at first sight encounter with a beautiful nurse (Teresa Palmer, from this summer’s Lights Out), Desmond is determined to follow his brother into World War II, as a medic so he can help people. It is during basic training that Desmond’s beliefs are put to the test, as he faces mounting pressure from his fellow recruits, his tough-as-nails drill sergeant (Vince Vaughn), his commanding officer (Sam Worthington, Avatar) and those with the power to make his life hell. Refusing to even pick up a gun, it is believed that Doss will prove to be a detriment to his fellow soldiers in combat if he can’t defend them with a weapon. Labeled a coward, Doss is implored to just pack up and go home. But even in the face of daunting opposition, he remains determined to serve his country in the best way he feels he can. When he is ultimately given that chance, at the Battle of Okinawa in the Pacific, during a brutal battle on top of a cliff known as ‘Hacksaw Ridge,’ Doss proves his fortitude and courage in ways no one could have imagined. What makes this story so incredible is that it is entirely true. 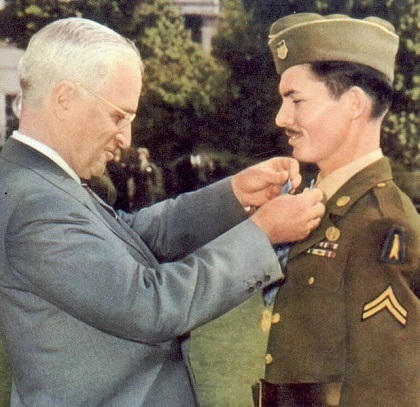 Doss saved over 75 of his fellow soldiers during that devastating battle, and to witness the depiction of that event on screen is truly awe-inspiring. In an interview on Late Night with Seth Meyers, Vince Vaughn stated that they actually had to tone some of Doss’ acts of heroism down because it wouldn’t be believable. And that such a cinematic tale is only now getting the big screen treatment lies in Doss’ humble nature and not wanting to romanticize his exploits. That makes him even more of a hero. Hacksaw Ridge marks Mel Gibson’s first turn at directing in a decade, since 2006’s Apocalypto. While his well-publicized incident and comments which derailed his career, both in front of and behind the camera, were certainly unbecoming, people deserve a second chance, and this rousing, emotionally-lifting film may be the one that gets him back into Hollywood’s good graces. A deeply religious man, it’s easy to see why Gibson would be drawn to the story of a man who puts his devout convictions ahead of all else, even if it might cost him everything. And as anyone who has seen Mel’s previous directorial efforts, the Oscar-winning Braveheart, The Passion of the Christ and Apocalypto, he is not one to shy away from extreme violence and gore. 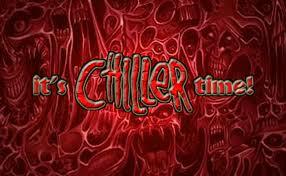 Limbs are severed, heads are blown off and bodies are burned beyond recognition. The initial battle sequence runs a good half hour and is one of the most mercilessly brutal, harrowing and relentless recreations of combat ever laid to film. At the end of it, you will feel absolutely exhausted, along with getting a sense of what these soldiers went through. What makes the war scenes even more amazing is that this was done on a non-Hollywood-size budget. As Gibson explained after a recent screening in NY which this Gore 4er was lucky to attend, he had a 30% lower budget than he had for Braveheart, and that was over 20 years ago. He said this was basically an independent film, with very little prep time, and the huge battle was filmed on a football-sized field in Australia. Kudos must go to Mel, and everyone involved in bringing this story to life. In addition to the extraordinary production design and effects work, the majority of which was done practically on camera, along with Gibson’s direction, the actors all do standout work. Andrew Garfield shines like never before in an Oscar-worthy performance, getting the audience to admire his convictions and follow him into battle. Teresa Palmer is a shining light as the woman waiting to come home to. Hugo Weaving is highly effective as the father struggling to show love for his family while not wanting his sons to experience the inner pain that he has suffered. Vince Vaughn, while eschewing most of the comedy he is known for, is still able to get some wisecracks in with this dramatic role. Sam Worthington is also excellent as the commander torn between doing what’s best for his men while accommodating Desmond’s rights. And Luke Bracey, as an antagonistic fellow recruit, gives his character added depth to what could have been a standard villainous role. In fact, most of the cast do a magnificent job of bringing growth to their characters as they begin to learn what Desmond is capable of. The screenplay by Andrew Knight and Robert Schenkkan is heartfelt and compelling, and unusual in its deviation from the standard three act script. In an age where mankind still hasn’t been able to find its way to avoid armed conflicts, where families are torn apart and forced to flee their homes and their homelands, and more potential wars loom on the horizon, it is inspiring to see this astounding tale of the first conscientious objector in American history to receive the Medal of Honor. In an America which finds itself divided over a Presidential campaign that offers two very clear and different choices, one who encourages divisiveness and violence, and one who wishes to bring people together, it is refreshing to be shown that wanting to help rather than hurt others is a sign of strength, not weakness. And in an America that is so overrun with gun violence, and stymied by one political party from doing anything about it, it is welcome to see a movie that shows you don’t need a gun to prove your toughness. Hacksaw Ridge, which salutes a man who refused to carry a weapon, yet saved lives, is the antithesis of Clint Eastwood’s American Sniper from two years ago, which glorified the exploits of a man whose job it was to take lives. It’s a fascinating contrast, coming from two iconic actor/directors who’ve each had their controversial moments. And it’ll be interesting to see if the gun-crazy, gung ho America that embraced Sniper and made it such a huge hit, will also accept a film that shows a different way of looking at life. Hacksaw Ridge is a phenomenal story of bravery and commitment to one’s beliefs that provides hope and inspiration during our turbulent times. It is a spectacular cinematic achievement that deserves a multitude of award consideration come Oscar time. And hopefully, come that time next year, we’ll have a country, and world, beginning to stand together rather than apart. SyFy’s Face Off is back on!